Corrupt Faction Of Deep State Has Their Backs To The Wall - Will They Soon Launch False Flag Of All False Flags? 'Establishment' Going Into Total Meltdown Over Trump - Putin Summit Hints Of Danger Ahead: Will They Attempt To Carry Out A Coup To Complete Globalists 'Take Down' Of America? While according to former CIA head and current MSM 'talking head' John Brennan, President Trump's news conference on Monday with Russian President Vladimir Putin was nothing short of treasonous, former US Presidential candidate and long-time US Senator from Arizona John McCain called the news conference "one of the most disgraceful performances by an American president in memory". And while McCain didn't mention Russian President Vladimir Putin's dressing down of Hillary Clinton nor George Soros, the independent media was quick to jump all over the shattering facts coming to the American people from the Russian President, facts that President Trump didn't disagree with. And while he didn't specifically call out Obama's intelligence officials in that tweet, he had done just that in two tweets nearly 15 hours before, one in which he stated "Our relationship with Russia has NEVER been worse thanks to many years of U.S. foolishness and stupidity and now, the Rigged Witch Hunt!" 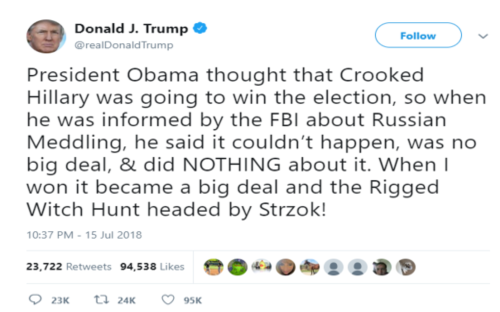 while in the other in which he claimed: "President Obama thought that Crooked Hillary was going to win the election, so when he was informed by the FBI about Russian Meddling, he said it couldn’t happen, was no big deal, & did NOTHING about it. When I won it became a big deal and the Rigged Witch Hunt headed by Strzok!" And as 'awakened Americans', we shouldn't be the least bit surprised that the msm began to claim that President Trump was pushing 'conspiracy theories' yet as we all know, sometimes 'conspiracy theories' are just the truth still hidden behind lies from the elite in their attempts to forever vanquish truth. And as anybody who reads ANP knows, the lies had been flowing like raw sewage from the mouths of Barack Obama, Hillary Clinton and the corrupt faction of the 'deep state' called the mainstream media for many years . And while Shipp claims that this time around, it won't be 'business as usual' for the corrupt and that they'll certainly be brought to justice because President Trump can't be bribed, we'd never recommend that anybody hold their breaths waiting for sweet justice to happen because we might be holding it for a very, very long time. With former FBI head and corrupt cop James Comey now tweeting "patriots need to reject the behavior of this president" sounding almost like a call for a 'deep state coup', should President Trump suddenly and without warning meet the same fate as John F. Kennedy, there'd be no doubt in the minds of most 'awakened Americans' who likely did it. According to this recent story from Asia Times, President Donald Trump is correct to blame the bad blood between the US and Russia upon Barack Obama, Hillary Clinton and the corrupted US deep state. 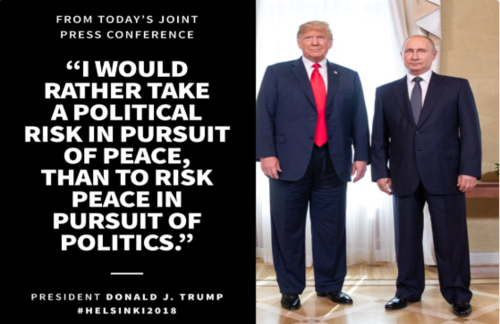 Claiming that those who are most upset right now are those who tried to redesign Russia in America's image, attempts that clearly failed, statements made by President Trump that "I would rather take a political risk in pursuit of peace than to risk peace in pursuit of politics" is one the entire Democratic establishment can learn from. Yet instead of seeing the very bright side of the two most powerful nuclear armed nations in the world getting along, they treat President Trump as if he is the 'enemy of the American people' rather than the first true American president that we've had in a very, very long time with Barack Obama selling us out to the globalists. 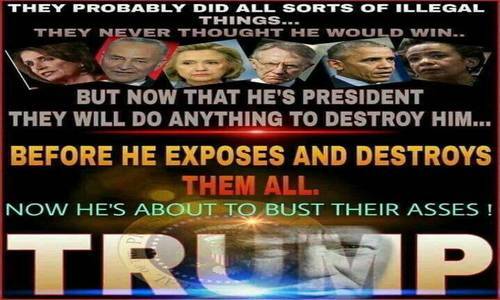 And with Shipp warning that President Trump will bring indictments against the corrupted deep state sometime in the future, specifically calling out Hillary for treason, the chance of 'enemies of America within' carrying out some kind of false-flag attack on America to take the attention away from what is about to be exposed to the still-sleeping masses continues to grow every day. So we pray that God cloaks President Trump with his armor in the potentially dangerous days ahead. The first video below is the full press conference between President Trump and Vladimir Putin from the White House Youtube channel while the 2nd video below from the X22Report takes a look at the desperation being exposed by the corrupted faction of the deep state scrambling soon after 12 Russians were indicted for alleged election interference. And for those who may have missed it, we've embedded Greg Hunter's viral and must-see interview with Kevin Shipp as the final video below.